The property is a 300 sq. m. cottage situated on 1 acre of mature gardens on the banks of the Owenriff River 1km from the village of Oughterard. There are 4 ensuite large bedrooms, 2 sitting rooms, dining room, and fully fitted kitchen. There is a veranda area from the sitting room overlooking the River. Two of the south facing upstairs bedrooms also have verandas with spectacular views of the surrounding countryside and the Owenriff River. Kathleen & John have been in the hospitality business for over 30 years. We are both Galway natives and moved to the picturesque and tranquil village of Oughterard 20 years ago. We live approximately 100m from the rental cottage and will be delighted to tell you all about the region and make your stay in the West of Ireland a memorable one. The property is a 300sq.mtr. cottage situated on a 1 acre riverside site. It is approximately 1km from the centre of Oughterard village on the N59 road leading to the Connemara region. The cottage has been completed to a very high standard and has all modern conveniences supplied. Oughterard village is known as "the Gateway to Connemara", an area famed for its spectacular unspoilt beauty. In addition, both the Aran Islands and the Burren region are only one hour journey away, making Oughterard the ideal centre for exploring many of the wonderful landscapes of the West of Ireland. The property has free WIFI. Riverside location. The property is located on the banks of the Owenriff River which flows into Lough Corrib. 10 mins walk to Oughterard village. Central location for Lough Corrib, Connemara, the Burren and the Aran Islands. En-suite bathroom to bedroom 1 with bath and shower. En-suite bathroom to bedroom 2 with shower. En-suite bathroom to bedroom 3 with shower. En-suite bathroom to bedroom 4 with shower. There are 2 interconnecting living rooms fully furnished one with TV .There is a patio area off the south facing room overlooking the Owenriff River with table and chairs for outside dining. The kitchen adjoins a large separate dining room and is complete with cooker, hob, fridge, dishwasher, microwave, electric kettle, toaster and all necessary utensils. Oughterard Golf Course is a parkland 18 hole championship golf course with Lough Corrib to the East and the Connemara Mountains to the North and North West. It is a 5 minute drive from the property and Galway, Barna and Galway Bay Courses are a half hour drive away. The Links Course at Ballyconneely is an hours drive from Oughterard. The house is wheelchair accessible with one downstairs bedroom and master bathroom en-suite. Notes on accommodation: The accommodation is completed to a very high standard with hardwood flooring and tiles. There is a combination of oil heating and electric heating. There are 4 bedrooms, all en-suite. One bedroom is downstairs with master bathroom en-suite. There is a fully fitted kitchen. The living room has TV and the south facing sitting room leads to a patio area overlooking the river. Outside: The property is set on 1 acre of mature riverside gardens. There is a veranda at the rear of the house overlooking the river. There is ample parking space to the front and on both sides of the house. A washing machine and tumble dryer are provided. Towels and linen are provided. Baby cot is provided if required. I can't praise this cottage enough, gorgeous Interior, very very clean and comfortable. Everything you could need has been thought out and added to the cottage for a truly wonderful stay. It's ideally located in a quaint little village.The property is even nicer than the photos and is ideally situated for your trips out. Kathleen lovely to deal with and could not have been more helpful . If you are thinking of booking this property please do so you will not be disappointed . Beautiful Property, Beautiful Little Village, Wonderful Hosts!! We just finished our vacation where we stayed at the beautiful Riverside Holiday House in Oughterard. From the moment we started conversing with the owner (Dolly), we knew we would be in for a treat! Our communications with her were always answered promptly, and Dolly was always so helpful. When we arrived, we were so happy. The pictures here accurately represent the property, however it was even nicer in person. Clean, nicely furnished and plenty of room. Dolly even had some basic foods for breakfast the following morning in the fridge. On-suite bathrooms were very nicely done! And there was a very pretty view of the river from nearly every room. The outside terraces were stunning! The village of Oughterard was an easy drive from Shannon airport, and the village offered several nice shops and great Pubs with fabulous food. We easily made the day trips to Roundstone, Clifton, Kylemore Abby, etc. We have been to Ireland 4 times now, and the Connemara area is the most beautiful from my perspective. You will love staying here, I know we will be returning! Thanks again, Dolly, for all your help, we truly enjoyed being the guests of you and John. GO GALWAY!!!! My husband and I together with our daughter and son-in-law had a most enjoyable weeks stay, in this lovely 4 bedroom home by the river. It is situated just outside the town of Oughterard where there are a variety of shops and eating places. The cottage exceeded our expectations it is very comfortable and has all we required and more. There are 3 balconies overlooking the picturesque fast flowing river. One of the ensuite bedrooms is on the ground floor and there are two lounges and a separate dining room. it is the ideal place to relax and unwind. Outside the gardens of the cottage are very pretty and edge the river bank where children should not be left unsupervised. There is ample parking for at least 4 cars. We spent our days exploring the very scenic areas visiting Galway, the amazing Cliffs of Mohar and many other places of interest. The owner has provided Information folders containing details of local points of interest and also restuarants in the town. The owner made us very welcome. A group of eight adult travelers stayed in this lovely home for one week, and we could not have been more satisfied. The house is beautiful, with ample space for our group without feeling crowded, the beds were comfortable, the location ideal as a base for exploring western Ireland. It was nice to be a short walk from town, where we found good food and friendly people. John and Kathleen were gracious and helpful hosts. I would love to return to this sweet spot on the river, and would not hesitate to recommend it to all. What a grand stay we had at Kathleen & John's! They were so hospitable and accommodating. It was a pleasure to meet them both and a privilege to stay in their home. The location is within walking distance of town. The accommodations were perfect for our family of 7. Kathleen was always ready to provide whatever we needed. We would definitely stay here again when coming back! Thanks a million Kathleen & John!! Kathleen's home was everything we asked for and more! We traveled with a large group (7)- 2 seniors, 2 students, 1 married couple & 1 single. The views and property are amazing from this home. Kathleen was a wonderful hostess leaving milk and biscuits(cookies) and cereals for us! The beds were wonderful (more like American queen size and 1 double downstairs for information purposes)! All en-suite. Everything immaculately clean and well-equipped. The kitchen could use some sharper knives (we love to cook and cooked in for breakfasts and dinners), but all in all we thoroughly enjoyed our visit for the week. The town is wonderful as well- good pubs and restaurants. Nice central location. We traveled to Clifden (beautiful ocean side town), to The Quiet Man's Bridge (from the movie), took a ferry over to the Aran Islands (gorgeous! Well worth it!) and toured many castles, etc. Galway pub tour and much more. We even left something behind and Kathleen promptly mailed it to our next destination! We are so appreciative! Highly recommended to stay here. Kathleen and John were like family from the start! Thank you so much. Lough Corrib is Ireland's 2nd largest Lake and renowned for its brown trout and salmon fishing. Oughterard has numerous walkways and the Western Way leads along the shores of Lough Corrib. The property is situated 25 miles from Galway airport, 50 miles from Knock airport and 75 miles from Shannon airport. Dublin airport is 3 hours away on the N6 Motorway. 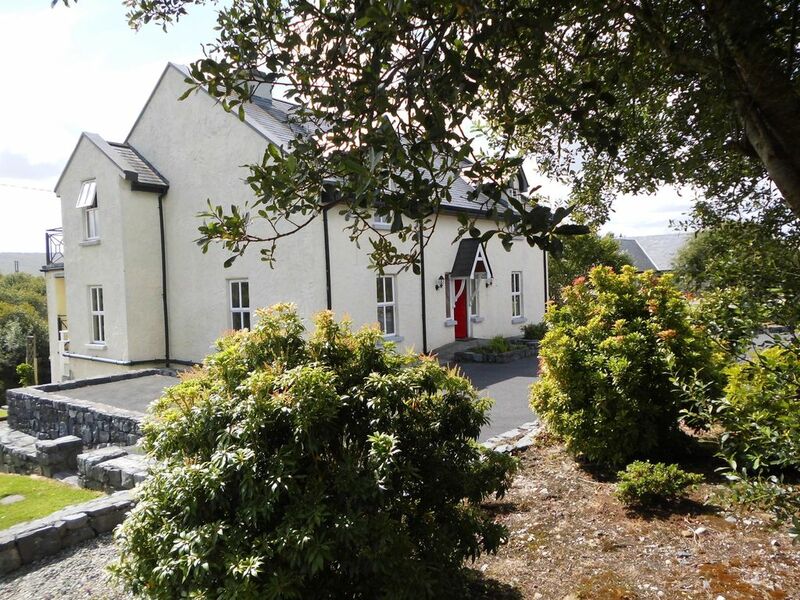 The property is situated in Oughterard village and 25km from Galway city. Other areas of interest in the area include: Aughnanure Castle, Brigits Garden, Corrib Cruises, Derroura Mountain Bike Trail, Glengowla Lead Mines, Inchagoill Is. Booking Notes: A booking deposit will secure your reservation. Changeover Day: The preferred changover day is Saturday but we will try to suit your needs. Preferred arrival time is after 4pm and departure time is 11am. Notes on prices: Prices are per one week rental. We offer a discount for long winter lets. Central heating and electricity are metered and charged at the end of your stay.